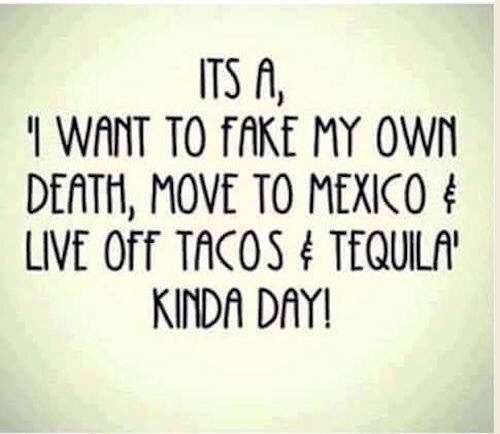 It’s a Live off Tacos and Tequila Kinda Day….Make That Week. All of Adam’s 12 years have been plagued with one medical issue after another. I have spent countless hours with him, in and out of doctor’s offices. In fact, I am fairly certain that I have taken him to every ‘ist’ known to the medical field. The poor kid has been poked, prodded, cut, stitched, scoped, you name it. All in search of a diagnosis which continues to evolve. This past week was filled with yearly follow up visits to his current doctors and specialists. In addition, we had an appointment to see a new ‘ist’. It’s truly been a ‘fake my own death, move to Mexico, and live off tacos and tequila kinda week. As we were making our pilgrimage to see a new doctor for a recent stomach issue that Adam has been experiencing, I remarked to Chris, rather crabbily, that I really just wanted to scream and yell at the top of my lungs, throw things, punch things…maybe even punch a few people. I wanted to shout every curse word that I could think of and in every combination that I could create. Adam has been vomiting out of the blue a number of times over the past 6 weeks; with no rhyme or reason. After visiting his pediatrician last week, we were referred to a gastroenterologist. Yep, that about sums it up. Spot. On. It truly amazes me how certain things randomly present themselves in life. Then again, maybe it isn’t so random. Regardless, I start to feel a bit less crabby. Trying to maintain my sense of humor has truly helped me get through everything with Adam. Heck, humor has helped me get through a lot of other crap over the years, too…. Maybe this really won’t be so bad. And, it wasn’t that bad. The GI specialist confirmed that he did not believe that Adam’s vomiting was due to stomach issues, but in turn pointed his vomiting back to his recurring sinus issues and environmental allergies. So the good news is that we are not going to investigate GI issues, the not so good news is that we’re working on the premise of speculation. Awesome. And so typical. We were back on the road, heading for home. I began to reflect on all of the doctor appointments that Adam had this week, and how once again, we didn’t get any definitive answers. As frustrating as this is for me, I realize that it is just a way of life for Adam. It’s all that he has ever known. He has never complained and always has a smile on his face despite everything he has been through. Once again, Adam’s journey is forcing me to keep perspective. Although this week was filled with a large amount of uncertainty, Adam was able to continue to get me see the humor in all of this. From singing ‘Cake by the Ocean’ at the top of our lungs on our way to the ENT, to Adam signing in as ‘Adam Gordon James Ketcham’ in the ENT office. (He continues to campaign for his name change) Then precisely announcing to the entire staff, at the pediatrician’s office that he is here because ‘he threw up his whole stomach at Culver’s. To his remark this morning, at 2:30 am, while we were awake and preparing for his sleep deprivation EEG; that he ‘would not eat cake by the ocean because the cake would be too wet and too gross’. He then proceeded to mention that he would, however, ‘eat pretzels by a port-o-potty’. I had no idea what he meant, but he sure thought his ‘witty’ remark was absolutely hysterical. I often get asked how I keep my sense of humor through all that we have experienced with Adam. Early this morning, as I sat in the dark watching the Minion movies for the one millionth time, it occurred to me. Adam helps me keep my sense of humor. Adam gets me through all of this. We help each other. However, I cannot deny that Mexico, tacos, and tequila still sounds kind of appealing! We leave him alone for one minute...and suddenly he’s making friends and posing with the Bishop! Congratulations on this very special day Alex!! LZHS production of SPAMALOT opens in less than TWO weeks!! Get your tickets today! You won’t want to miss this HILARIOUS production!! Arrivederci Venice! My favorite city by far!